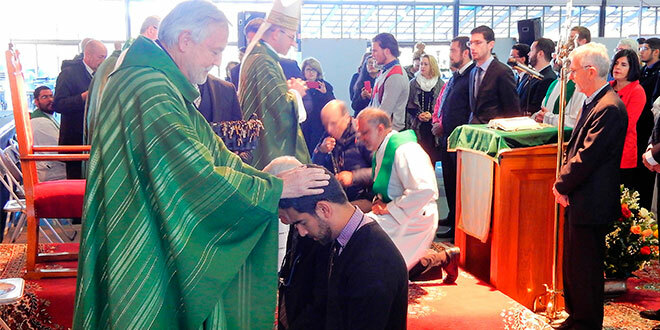 Sent forth: Fr Tony Trafford (foreground) and Sydney Auxiliary Bishop Anthony Randazzo lay hands upon each two-by-two missionary, sending them to announce the Gospel. FOR 10 days, Brisbane Catholic Stephen Kearney put his IT job on hold to tread the winter streets of Sydney’s inner west, announcing the Gospel. He took no money or mobile phone, only the Bible and rosary beads, and walked with a companion, a priest from Perth, visiting Catholic parishes, talking with priests and parishioners and anyone he met, knocking on doors or on the street. “We would tell people we met: ‘We are missionaries, we have come to proclaim the love of God’. They welcomed us with open arms,” Mr Kearney, who is married and with three young children, said. He was one of nearly 200 men and women aged from 18 to 79 – members of the Catholic Church’s Neocatechumenal Way – who were recently sent out on a “two by two” mission in cities and country towns across Australia. About 20 men and women from Brisbane took part. It may seem counter to contemporary society, but throughout the history of the Church, members of religious orders have been sent out in this way to announce the Gospel. In Sydney the two-by-two teams spent three days in prayer, scrutinising the scriptures and preparing, before Queenslander and Sydney Auxiliary Bishop Anthony Randazzo and Neocatechumenal catechist Fr Tony Trafford laid hands upon each person, sending them to bring the love of Christ to the people, fortified by the Holy Spirit. It isn’t easy to rely on providence on the streets in July. Mr Kearney was sent to Sydney’s multiculturally rich Bankstown area, with strong Muslim and Maronite communities. “We saw parishes that basically had no one in them, and others that were packed for weekday Masses,” he said. “When we went to a parish we went to the priest first to ask if there were any parishioners we could talk to. For three of the 10 days Mr Kearney and his mission partner ate little – a dinner bowl of noodles, a sandwich for breakfast the next day and on the third day a packet of biscuits. One night the two men huddled without sleep in a park, some nights they slept on floors, and one night they entered a church and were told by the priest they couldn’t sleep there, but the door of the chapel was always open for adoration. So the pair joined a parish adoration session and prayed the Rosary all night. “We had no sleep and no food, but we were warm and had a great time,” Mr Kearney said. Brisbane woman Sarah Bunting, a teacher at Seton College, was another to set out on the mission. 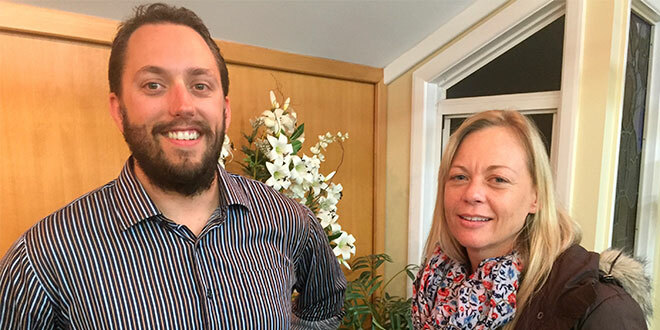 Announcing the Gospel: Stephen Kearney and Sarah Bunting both joined the “two by two” mission in cities and country towns across Australia. Ms Bunting, worked for two-and-a-half years as a missionary in Alotau in Papua New Guinea, and last year led a 20-member PNG contingent to World Youth Day in Poland. “I learnt from my pilgrimage to WYD in Poland to put my trust in Jesus. I could see my trust was very small,” she said. Ms Bunting said she took up the two-by-two mission because she “wanted a reminder of who I am in the Church”. “To come out of being condemned to live for myself. I wanted to have no plans and see where God would take me,” she said. Ms Bunting teamed up with 57-year-old Sri Lankan woman Jeanne Stanislaus. They were sent to Wollongong diocese, where they spent 10 days in parishes near Campbelltown and Ingleburn in Sydney’s south-west. They would first make contact with the parish priest, often arriving unexpected, and then walk the streets and visit homes. “On the first day, I was a little bit fearful. I didn’t know where we were going to sleep. We saw a lot of broken people, suffering, coping with drug addictions,” Ms Bunting said. “I was really surprised at how people wanted to know what we were doing. “People were looking for answers and it was a hope for them. In churches and parishes they met people and were encouraged to speak to them. They also visited a Catholic retirement village, where they just sat and listened to people speaking about their lives. At the end of their 10-day mission, Mr Kearney, Ms Bunting and the other street missionaries sent out across the country met together at Sydney’s Redemptoris Mater Seminary, Chester Hill, to share their experiences. Sydney Archbishop Anthony Fisher came to listen. He assured them that “the peace of Christ they had given and received is the real treasure our times are lacking”. “It makes the life of the Christian much more than ordinary, a rich gift for the other,” Archbishop Fisher said. Fr Trafford said all the two-by-two missionaries returned safely, “telling of unique adventures, but above all rejoicing, just like the apostles in the Gospel”. “Jesus exclaimed that he had seen Satan fall like lightning from heaven, because the announcement of the Gospel brings Satan down from the high place he has claimed for himself in our lives,” he said.